The 15-chapter book includes current information on the bleaching of green oils and coconut oil, quality requirements for frying oil applications, and more. Written for the non-chemist new to the industry, the book makes it simple to apply these important concepts for the edible oil industry. M. K. Gupta is the president and founder of MG Edible Oil Consulting International, Inc. He founded the company in 1998 utilizing his 45 years experience in the field of oil technology and food processing. He holds a Master's degree in chemical engineering from the University of Florida, Gainesville, Florida and was named Fellow at the American Oil Chemists Society (AOCS) in 2008. 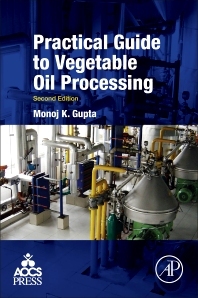 Provides detailed information on how to process vegetable oil.